A school governor at Barrs Court Primary School in Longwell Green tried out a new career today to help launch a road safety campaign. Governor Simon Isaacs, pictured, helped promote the Stop Means Stop campaign by carrying out the role of the school crossing patrol. He was guided by Karen Ross who usually carries out this role. Our road safety officers joined forces with other local authorities in the South West to help promote the Stop Means Stop campaign; a road safety initiative aimed at drivers to make them aware that when a school crossing patrol staff member holds their sign out in the road, they should stop until the patrol returns to the pavement. While incidents of drivers failing to stop in South Gloucestershire are rare, Barrs Court Primary has been chosen as the focus for the campaign following a recent drive-through where the ‘lollipop’ sign was knocked out of a staff member’s hand. 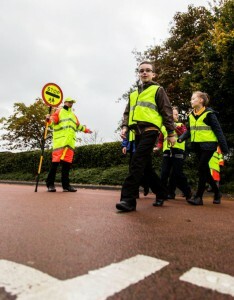 Wendy Feltham, Road Safety Officer at South Gloucestershire Council, said: “We value our school crossing patrols and the dedicated work that they do in ensuring our children travel safely to and from school. They should not be subjected to dangerous behaviour from a small minority of drivers so we are joining forces with other councils to promote the Stop Means Stop campaign. South Gloucestershire Council has a total of 41 patrol sites covering schools in the district.